I decided to rename this “Shark Chum” after my wife made it last night. I’ve got my little Shark’s Den downstairs and I was down working on some cards and our son yelled that dinner was ready. The minute I hit that first step, I could smell the awesomness…this stuff smells amazing! Shark Chum – “Chumming” is the practice of luring various animals, usually fish/sharks by throwing “chum” into the water. This attracts the sharks due to their keen sense of smell. Trust me, if I smell this stuff cooking, then I’m headed that way! We are big fans of Chinese food and this does seem to do the trick as far as trying to have an egg roll but still stay on Sharketo; just remember, with any Sharketo recipe, you can adapt it to fit what you want. My wife has made this a couple of times and tweaked the recipe that you would normally find on the internet to something that works for us. The first time we used shredded pork and the second time we used shredded chicken breast. This is pretty much our new “go to” thanks to the smell of sesame oil! You cook up the pork or chicken however you like- brown it in a skillet, boil the chicken or throw some pork in the crock pot. If you did anything besides “browning it”, you will need to shredded the meat and put in the skillet. Throw in the onion and sesame oil and cook over medium heat while mixing. Mix soy sauce, garlic and ground ginger together in a small bowl and add once the onions have browned. Immediately add the cole slaw/cabbage to the mixe and toss to coat everything evenly. Continue cooking over medium heat for 3 minutes. 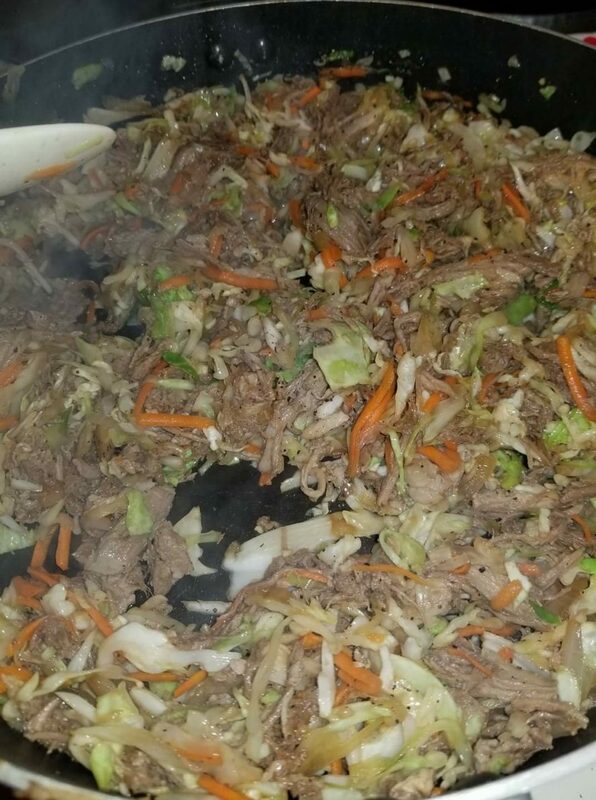 The cole slaw/cabbage won’t take long to cook and just keep mixing to ensure everything gets coated with the soy sauce, garlic, ground ginger and sesame oil. Below is the nutrition facts based on chicken breast and cole slaw mix- if you use pork, cabbage or make any changes, it will affect the nutrition facts and the MACROS. It’s got a lot of protein so you will need to up your fat in other meals- I suggest using Shark Piss coffee which is listed in the recipes. This stuff is easy to make and tastes amazing!